On Saturday I went along to this event in University of Stracthclyde Innovation Centre. Orgainserd by Rob Smith and Bill Boyd in association with Scottish Film Education. There were over 20 presentations and talks on a wide ranging set of topics. The problem at events such as this is to decide which talks to go to and the regret on missing others. This can be exacerbated by watching the tweets from other sessions. I tried to guess which ones would be suitable for broadcasting and podcasting. This is tricky at a conference based around film. During the day I broadcast from 8 sessions and David Gilmour (@dgilmour) kindly recorded more. This will be published on Edutalk over the next week or so. ScotFLF15 | EDUtalk, the links here should update as they are added 1. Some of the recording start slightly late, due to my getting to the room late and a few will feature a samba band from the street as a background. What they lack in audio quality the make up for in content. Although I’ve worked with creating video with and without pupils a fair bit I am not very knowledgable about film so I found interesting things in all of the sessions I attended. It would be hard to pick out a favourite. I certainly learnt a lot of new stuff from Rob Smith about Using Film in the Classroom and David Griffith talking about grammar in both text and film in From Shots to Sentences. I am more familiar with the work of Jennifer Jones on the Digital Commonwealth Project, but really enjoyed her talk and was delighted to get a hard copy of the ‎Handbook of Digital Storytelling as I’ve pointed folk to the pdf many times. I suspect I missed a lot of details from the talks as I was recording I hope to gain from listening to and editing the recordings. 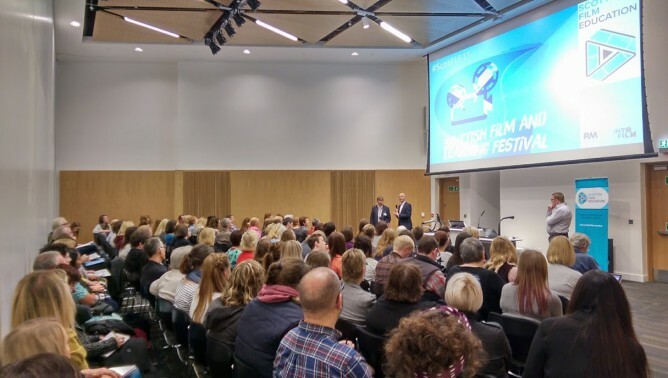 I do not know the official count of participants but it seemed pretty busy to me, as usual the number of Scottish teachers willing to go to cpd events in their own time is commendable. Some had travelled a fair distance and must of got up early. (Great to see Neil Winton). At a cost of £25 with plenty of coffee, pastries and a tasty lunch this was amazing value. There was a great buzz throughout the day. I’d recommend going along next year (I believe it will be run again). Feature Image credit David Gilmour.